We are excited to announce the launch of Beta sites for Duet - A Tablet and Cloud POS solution! - Subscription based POS solution. - The use of wireless and cloud technology. - The ability to process credit cards even if your Internet is down. - An easy to use interface. - Top level security protection. If you are interested in becoming a Beta site, call us today! a point of sale made for your liquor store. 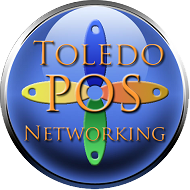 Toledo Point of Sale & Networking has been in business since the early days of cash registers. Although it has not always been Toledo Point of Sale. Our roots started with NCR and Toshiba TEC cash registers as NOCRS in Toledo. As technology changed, so did our system focus and company name. Toledo Point of Sale has always been a local company providing complete system solutions that fit your business needs.